The SJSU Cares Program and the SJSU Student Hunger Committee are hosting a Spartan Food Pantry Opening Celebration Thursday, April 18 from 3:15 to 5 p.m. just outside the Spartan Food Pantry (between the Engineering Building and the Diaz Compean Student Union). This is an opportunity to welcome campus and community partners to get a first look inside the pantry. Opening comments and ribbon cutting will take place at 3:30 p.m. Light refreshments will be served. Non-students attending the opening are encouraged to bring a food or toiletry item for donation. Spartan Food Pantry opened its doors March 25 at 2 p.m. for the first participants. 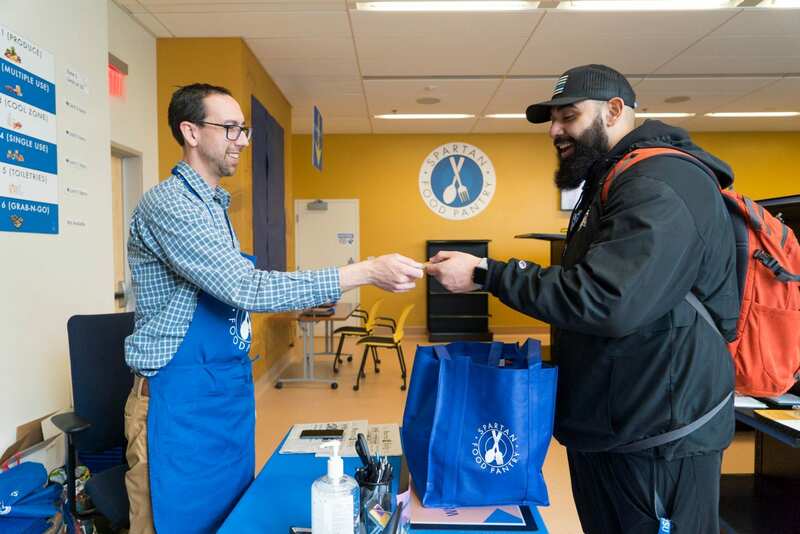 The new pantry is an expansion of SJSU’s commitment to supporting students who are experiencing food insecurity, and is a partnership between SJSU Cares, Second Harvest of Santa Clara and San Mateo Counties (SHFB), and donations. “SJSU would like to thank Second Harvest Food Bank of Santa Clara and San Mateo Counties for working with us every step of the way as we open the Spartan Food Pantry, which will ensure our students have what they need to prepare nutritious meals while completing their studies,” President Mary A. Papazian said. Those involved in the pantry are planning an open house for staff and faculty to tour the facility this semester with a date and time still to be determined. At SJSU’s fall 2018 Inspiration to Innovation Gala, Second Harvest Food Bank of Santa Clara and San Mateo Counties was recognized with the Community Partner Award for its support of students through Just In Time mobile food pantries. In 2017, Second Harvest began providing fresh fruit, vegetables and groceries to SJSU students at monthly mobile food pantry events on campus. During the 2017-2018 school year, the Just in Time program served 4,513 students a total of 156,086 pounds of free food, providing groceries for over 500 Spartans at every event—equivalent to $430,000 in groceries. The new pantry is set up like a grocery store and eligible students will be able to “shop” through six zones including fresh produce, chilled items, dry goods and toiletries, among others. Once students complete the Spartan Food Pantry intake and agreement form, students can stop in once every seven days for groceries. The pantry is located in the Diaz Compean Student Union, with an exterior entrance across from the Engineering Building rotunda. San Jose State is proactively addressing issues of homelessness and food insecurity on campus through a program called SJSU Cares (www.sjsu.edu/sjsucares) that offers individualized support by connecting students experiencing economic crisis, housing or food insecurity to a number of resources. SJSU is committed to identifying strategic ways to address the challenge of informing our students about all of the resources accessible to them.